Berwick's amazing Town Walls were changed forever in 1558 when Mary I ordered the Military Engineer Sir Richard Lee to fortify the existing walls in order to secure the Town against Scottish attack. The feat of engineering cost £130,000 which made the endeavour the single most expensive undertaking in the Elizabethan period! Ironically the threat from the Scots was over before the project was completed. Mary Queen of Scots fled to England in 1568 and with it ended the tensions between the Countries as it became clear that James VI of Scotland would succeed Elizabeth I of England and become James I. There was no further work done to these walls for the remainder of Elizabeth's time as Monarch. The Walls were modified again in the 17th Century and the threat of a Jacobite rising meant that they stayed in a state of good repair through the 18th Century and onwards. It is now possible to walk the full circuit of the Town Walls which offers stunning views of the coast, the estuary and Robert Stephenson's 'Royal Border' bridge. The Gymnasium Art Gallery is open from April to December annually and is located inside Berwick Barracks. It hosts and takes part in many events throughout the year (including the annual Film Festival) and has many exhibitions and a fellowship programme. 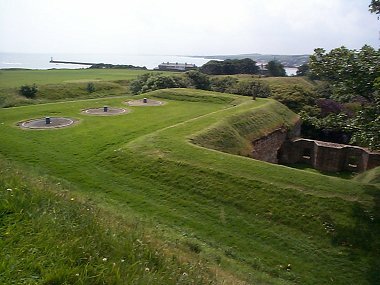 Perhaps the most famous and the most obvious walk in Berwick is a complete circuit of the ancient town walls. This walk is best started from the Castlegate car park and is approximately one and a half miles long. It takes in spectacular views of Berwick's bridges, the river and estuary, coastline and passes close by the Barracks. Being a circular walk it has the added bonus of bringing you back to the car park when you have finished! The route for the walk is marked on our interactive Berwick Town Centre Map, as is the Castlegate car park. A full description of the walk is available here. Lowry is one of Britain's best loved and most famous painters and visited Berwick regularly during the 1930's until the year before he died. Many of his best paintings were done here and the trail takes in all of these important spots and highlights points of interest along the way. The walk is longer than the tour of Berwick Town Walls (although it does cover some of this ground) and crosses the bridge to Tweedmouth and along the coastline to Spittal. More information about this beautiful and interesting walk can be found here. Guided Walks of Berwick (run by Time to Explore) happen from Easter through to September. Walks take place Mondays-Friday and Sundays and cover a unique circuit of the Elizabethan Walls (ticket costs apply). The Time to Explore website also offer free downloadable self guided walks around the Town. Northumberland's beaches are legendary in their beauty and Spittal beach is the most Northerly of them all. Located to the South of the River Tweed the beach is popular with walkers. The Good Beach Guide describes Spittal Beach as 'Mainly sand with shallow water at high tide' and the water quality is recommended for the highest UK standard for bathing water quality. Berwick is well served for the golf enthusiast. The County as a whole offers a unique golfing experience and there are two links courses very close by. The first is Magdalene Fields Golf Club which is just to the North of the Town Centre and is the most Northerly Golf Course in England. In 1914 this 9 hole course was extended to 18 holes and offers beautiful views of the coast, Holy Island and North over the Scottish Border. Goswick Links lies six miles South of the Town, measures 6,803 yards and is a championship course that has been used as a qualifier for the Open Championships. If you fancy a trip over the border into Scotland, a short drive North there is also Eyemouth Golf Club. As i mentioned earlier there are many stunning Golf Courses in Northumberland, be sure to visit our Golf page for full details. The River Tweed is an excellent fishing river and is a very popular place and is famous around the world for it's Salmon. An excellent website with a huge amount of information about the river, the best fishing spots, daily river levels and clubs is Fish Tweed. Located just to the North of Berwick, with easy access from the A1 is Conundrum Farm. They have a Farm Trail that is full of interesting animals to meet and feed, including a pet barn and a pedal tractor circuit. They also have a licensed restaurant serving home cooked baking and lunches.